La Pergola remains one the true beacons of fine dining in Rome. There’s not much I can add to the litany of great write-ups this iconic restaurant has garnered over the years. Sure, you’ll find someone who has something to criticize after having dined here, as is almost inevitable with any three star Michelin restaurant where expectations are inordinately high each night. However, I believe that La Pergola, quite differently from most restaurants, has actually improved over the years, and not by a small margin, either. Whereas twenty years and even ten years ago I might have left some evenings scratching my head (examples include some less than memorable creations as well as the steep wine markups) I find this, rarely, if ever, to be the case nowadays, where everything, prices included, seems to be just fine. Head Chef Heinz Beck (German by birth but Roman “in everything else, Italian wife included” he smiles) is not just supremely talented, but a genuinely nice man, and his gentle personality carries over to the whole team. Restaurant manager Simone Pinoli is a recognized master of the dining room and head sommelier Marco Reitano is one of Italy’s top five at his craft. Observing Reitano and sommelier Matteo Anselmi at work, you won’t be surprised to know the two have been at the restaurant for twenty years each. After all of that time working together the pair move like clockwork: unobtrusively, gracefully and competently. On this night, the appetizers are delicious. The white truffle grated generously onto the artichoke, scallop and egg dish is simply extraordinary.The smell of this particularly large truffle is so intense, dogs back in Piedmont probably picked up its scent. It is the first rate quality of ingredients such as these that also helps set such star-studded establishments apart from the rest of the pack. That said, the absolute stars of the night are the two primi, dishes I’d go back to La Pergola for literally every day. The fagotelli “La Pergola” have become a modern classic. 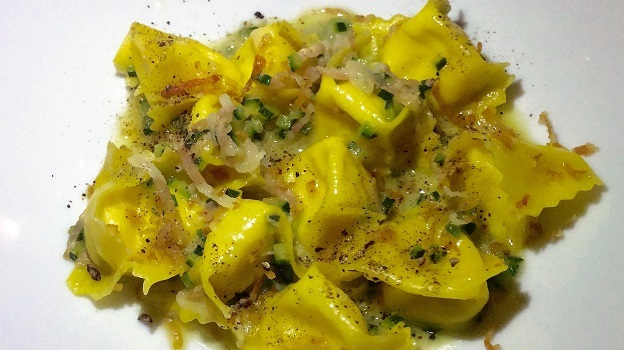 Delicate egg ravioli-like pasta morsels are filled with Rome’s favorite son, the carbonara sauce (egg, cheese, pig cheek). In other words, in this memorable dish the sauce is inside, not outside, the pasta. 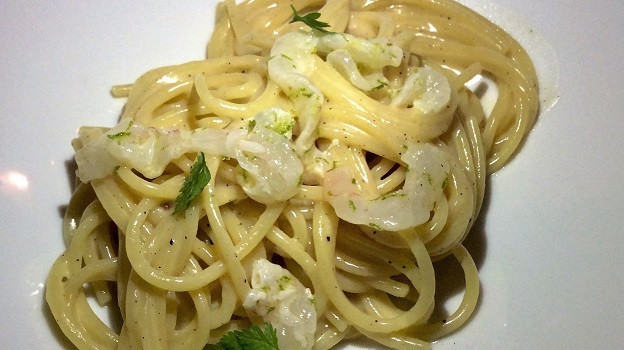 If at all possible, the cacio e pepe with lime-marinated shrimp is even better. A sublime take on Rome’s classic fresh sheep’s milk cheese and ground black pepper staple, but one in which the freshness of the lime and sweetness of the shrimp take the dish to a whole new and very lofty level. Concentrated and rich, yet very precise, the dish leads me to contemplate, if only for a moment, diving down onto the table and licking the plate clean! I am proud to report I kept my absolutely worst instincts in check (though it wasn’t easy). Simply put, if you like food at all, then you simply cannot tire of two marvelous dishes such as these. 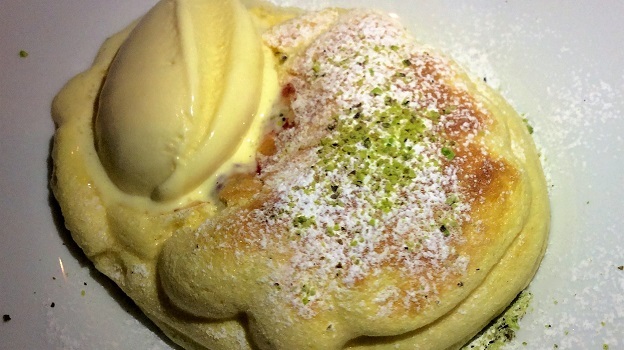 The rest of the night’s dishes are fine, with an honorable mention going to the raspberry au gratin dessert, that easily makes my “ten best desserts” of the year list. Clearly, perusing the two hefty wine lists (one devoted to Italian wines, the other listing foreign wines) at La Pergola takes some time, so tell your dining partner to arm him or herself with patience (the lists are not available on the restaurant website). The 1999 Künstler Hochheimer Hölle Riesling Spätlese Trocken starts off a little heavy and too savory, but becomes more graceful and sweeter with aeration; its lively acidity makes it a good aperitif and its rich texture allows it to stand up to structured dishes as well. 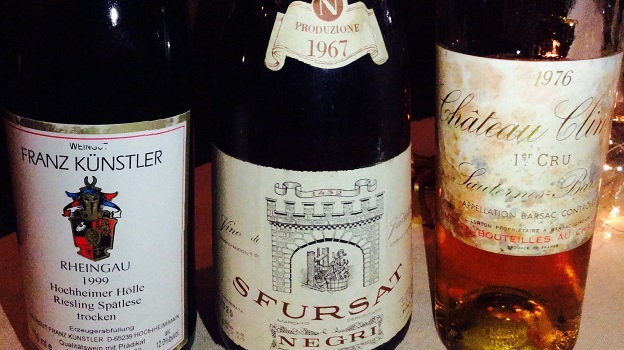 The 1967 Nino Negri Sfursat is a work of art, confirming all the great things us Nebbiolo-lovers already know. Simply put, the grape is truly a gift of God to man. Even when lightly air-dried, the variety allows its wines to retain an elegance and refinement that many other famous red varieties can only dream of. This 1967 is still youthful, with delicate sour red cherry, tar and faded rose petal aromas and flavors supported by noble tannins. Last but not least, the 1976 Chateau Climens is a marvel of balance and precision, and practically dry on the concentrated but vibrant, spicy finish. In retrospect, I would have done much better to pair this with the scallop and yellowtail dishes at the beginning of my meal. At evening’s end, the whole La Pergola experience, complete with the thoughtful, personalized menu of what you have eaten and drunk on the night (handed over on your way out), will remind you of a well-oiled machine where everything marches along effortlessly, quietly and without glitches. And it will leave you wanting to come back.